The memorial grove obelisk commemorates those who died in service or were killed in action during World War One. The obelisk was originally unveiled in the memorial grove in 1925. It is unknown when it was shifted to its present position. The obelisk lists the names of the fallen of World War One. 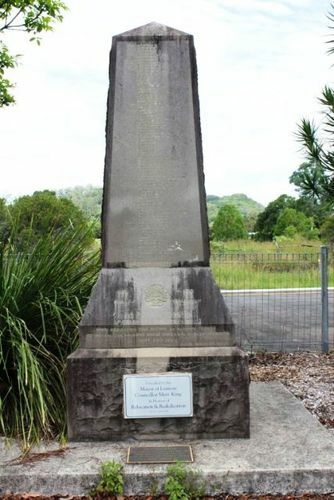 The memorial grove was planted on Alexandra and Winterton Parades, North Lismore. A meeting of subscribers and others interested in the proposed Lismore fallen soldiers' memorial grove was held at the Council Chambers last night. Mr. B. Muldoon presided, and others in attendance were Messrs. S. Strong, W. F. Oakes, T. Winterton, E. A. Thompson, J. F. O'Flynn, D. J. Jolly, T. F. Milgate, D. Watson, W. Longley, T. Richardson, J. C. O'Meara (secretary), Lt.-Colonel F. J. Board, Major R. Mc.K. Fraser, and Mrs. F. W. Lance. Mr. Muldoon explained that the meeting was the outcome of the meeting held the previous Wednesday which had not been in a position to come to any decision. In reply to the committee's request for information on the memorial grove question, the town clerk wrote stating, that the grove, when completed, would contain 126 trees, of which 91 had been paid for. Sixteen more trees were required to complete, the grove, but no more would be planted this year, as the season for planting had passed. The total cost of each tree was £1 10s 8d. Mr. Oakes said he favoured an obelisk in the grove, instead of individual tablets. He was not particular what class of tree was planted, though a combination of jacarandas and silky oaks would be appropriate. He would donate a further £5 to the funds. Mr. Winterton contended that a thorough explanation of the cost of planting the trees was required. It appeared that the council had no patriotic spirit whatever. Several speakers expressed the opinion that as the council had already had many trees planted, it was useless to pursue the method of planting any further. Lt. Col. Board thought an obelisk should be erected, and that the names of all the soldiers who went from the municipality should appear on it. Mr. Winterton said the council had broken its promise to plant jacarandas. Mr. Longley said the council had decided to plant silky oaks, believing the decision to be a good one. However, he thought time would prove the council was wrong, and that jacarandas would prove the most suitable trees. He was in opposition to the proposal to erect, an obelisk for sentimental reasons he preferred a green and living memory to fallen soldiers. Mr. Muldoon pointed out that the question which they were to decide was whether they were to have an obelisk containing all the names or individual tablets on each tree. The expense would debar them from having both. Mr. Oakes moved that in the opinion of the meeting an obelisk be erected bv public subscription. He said an obelisk would be far more impressive than a number of names placed on the tree guards. A plan had been submitted of a 12 feet obelisk, but he did not think this would be sufficient; it should be at least 25 feet. He thought an appeal for funds for the obelisk would meet with a magnificent response from the district. Northern Star (Lismore, NSW), 1 October 1925.